Pandemic Legacy is a co-op board game that raises the stakes by adding permanent (like, actually permanent) changes to the board as you play, and it’s amazing. It also happens to be marked down to $39 on Amazon today, matching the best price we’ve ever seen. 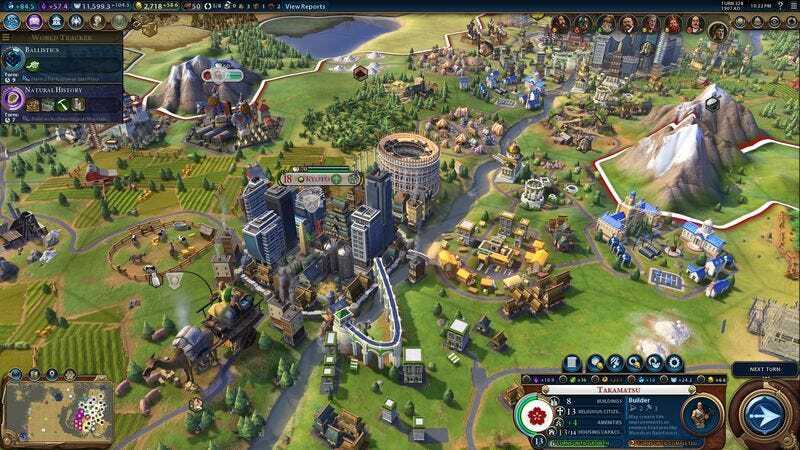 Earlier Civilization games feature prominently in just about every PC gaming sale under the sun, but the price tag for Civ VI has been remarkably stubborn. Today, though, Amazon’s taking $12 off the base game (unlocks via Steam) or $20 off the digital deluxe version, which includes a soundtrack and four post-release DLC packs. Hint: Get that one. Here’s the bad news: The Nintendo Switch can only run for about three hours on a charge while playing Zelda. The good news? Nintendo opted to use USB-C for charging, meaning you can use a battery pack to keep it alive during a long flight. Jackery’s Titan S includes two standard USB ports (one with Quick Charge 2.0), plus a USB-C port that you’ll use both for input and output. Depending on the game you’re playing, it might not actually charge the Switch so much as dramatically slow down its discharge rate, but either way, the result is longer battery life. So hook up a C-to-C cable, recline your seat, and enjoy the trip sans-battery anxiety. It’s not often that Amazon features a laptop as one of its deals of the day, so anyone who uses a desktop at home or work should definitely check out this $280 Lenovo Thinkpad Yoga for their portable computing needs. Although this laptop runs Windows 10, its price is pretty similar to a lot of Chromebooks, though its 4GB of RAM, 128GB SSD, and quad core Intel processor far exceed what you’d find in most of Google’s alternatives. The real highlight feature, though, is its IPS touchscreen. Sure, at 11.6” and 1366x768 resolution, this might not be your main computer. But since it’s a Yoga, you can flip it into all sorts of different poses. Need to carry it around? Turn it into a tablet. Finished working on a plane and just want to watch a movie? Flip it into stand mode to get the keyboard out of the way. Is it an amazing laptop? No. But it’s a very solid deal at $280. Just note that this price is only available today, and it could very well sell out early. My name is Jillian, and I’m a stomach sleeper. Even though for years people have told me how bad it is, it’s just the most comfortable position out there. And Amazon’s Gold Box isn’t judging me, or you if you like to belly flop into bed. Today only, grab individual or sets of goose down pillows for a heck of a lot less than what you’d normally pay. We see deals on WeMo switches and TP-Link Smart Plugs on a pretty regular basis, but this similar product from Koogeek is Apple HomeKit certified and only $24 today, the best price we’ve seen. Like those other smart switches, the Koogeek Wi-Fi Smart Plug includes an app for turning your electronics on and off and putting them on a schedule. The key difference here is that you can also control it with Siri from your phone or from Control Center in iOS 10. That’s a big deal if you’re an iPhone owner, and with promo code TQHF38XS, you’re not even paying a premium for it. Strip lights can add dramatic accents to the undersides of cabinets and furniture, and this 16-foot strip from OxyLED can also glow in 20 different colors to fit your mood or decor, all for just $15. If 16 feet is too long, you can cut this strip after every third light without damaging it, and if it isn’t long enough, you can even daisy chain multiple strips together with these inexpensive connectors.